You don't often get villains who win - not outright win. Mostly the best they can hope for it to make the heroes' victory costly enough for everyone to walk away feeling depressed (and any villain who does manage the occasional moment of brilliance is liable to be retconned into some kind of tragically tormented hero-gone-wrong in the sequel). 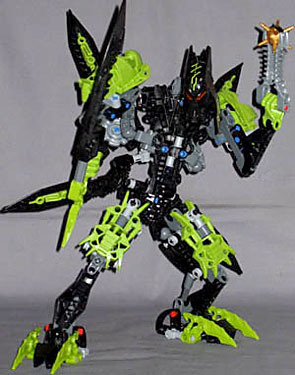 Bionicle's Big Bad last year... well, he won. The dude became God, that's pretty definitive. So this year's contender for Galaxy's Nastiest Biomechawhatsit has big Technic shoes to fill. Leading his rock tribe legions on a quest to conquer all of Bara Magna, Tuma is a massive warrior and master of the sword and spiked Thornax launcher. Cruel and warlike, Tuma will rule the planet or see it ground to dust. I admit I don't pay an enormous amount of attention to the storyline of Bionicle, but the little comics turn up along with the free magazine and occasional catalogue, so I get the basics. Tuma isn't what you'd call a complicated antagonist - he's more your classic Evil Warlord, familiar to anyone who's ever wielded a sword in pursuit of fame and treasure. He's of the opinion that the world ought to be his - not for Doom-like totalitarian benevolent "I know what's best for everyone better than they do" reasons, just because he's an arrogant prick - and he's going about it in the fairly straightforward manner of secretly amassing a huge army that'll crush everything in its path in one giant surprise planetary blitzkrieg. He may not be a nice guy, but you've got to give kudos to his obvious respect for classic golden-age villainy. Another trait of the traditional Evil Warlord is that, unlike your Blofelds or Mekons, he's not afraid of a fight - he's at least a physical match for the hero, if not massively more physically powerful, and while he may throw a few Death Guards or whatever at intruders in his Dread Fortress just for show, he'll have no qualms about then getting up off his Skull Throne and making things personal. 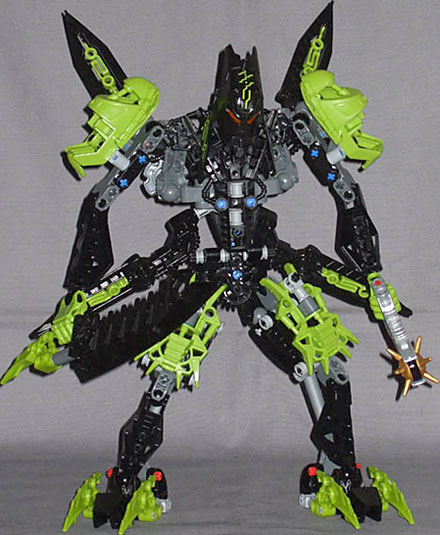 Fittingly, Tuma is the titan of first-half 2009, built along the same lines as earlier models like Takanuva and Makuta Icarax, with the standard Bionicle frame heavily augmented to add height, breadth, and sheer armoured mass. The basic titan humanoid body is in place, with its reinforced joints to support the increased weight - pressure pistons between heel and thigh, and twin joint frames at the hips and shoulders - so he can manage pretty much whatever pose you like without sagging. His feet are long and broad, with the claws on either side of the main foot offering extra stability, while the reinforced hips and shoulders, besides twinning the joints for strength, are complex structures to preserve the maximum possible range of motion. The central torso, aside from cosmetic parts, is just a simple spine with no waist or sternum joints - that's been the case since last year, but I'd really like to see a return of some variety of Maxilos' interconnected torso joints, which seemed far less robotic than the simpler bodies titans have used since then (ironically, he was a robot). There are three key features to Tuma's appearance. The first is his mask, which like all Glatorian masks attaches to the top of the head rather than the front. Or perhaps it's all head - I don't recall seeing any reference to masks in the Glatorian comics. Whatever it is, it's dark, heavy, and menacing, with two huge prongs sticking out either side of the jaw like tusks, and three stickers (two for the tusks and one on the forehead) to add detail. The open back also lets in a lot of light, and the front of the "mask" is very close to the head piece inside, so despite the face being black - which normally tends to hide the eyes - Tuma's red eyes are always visible, glaring balefully out. The neck is a double balljoint, top and bottom, and designed to be hunched deeply forward, which brings us to point two: the positioning of armour. 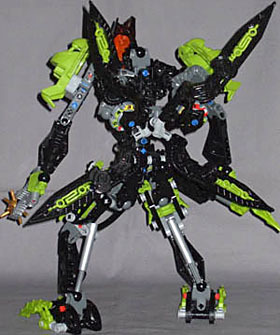 Although the body itself isn't that unusual by Bionicle titan standards, Tuma's heavy thigh and shoulder armour (both made from bulky foot pieces) gives him a lumbering juggernaut kind of look. Between that and the hunch and the protruding "jaw" of the mask/face, he reminds me rather of a Warhammer Orc (the massive chopper sword helps too). Thirdly - most obviously, but as it turns out least interestingly - there are the four blades on his back. They're mounted on two swivelling frames, left and right, so they're not all independently mobile nor can they tilt further back, or further inwards to protect the spine - in fact, if they're intended to be defensive, they're not very well designed. Mind you, Tuma doesn't look like the kind of guy who thinks defensive - in a head-on charge, they'd have the same kind of effect as scythes on a chariot's wheels, which may be what he has in mind. The dorsal blades also sport Glatorian's game-related custom bit, the life counter - little rotating discs with numbers on them. Score a hit, lose a life, it's pretty straightforward. The little Agori don't have a counter (presumably they only count for one), while the capsule-sized characters have a single counter each; Tuma has two. Lego's message is obvious: if you want to win, buy the biggest fighters. Each character's instruction booklet contains simple rules, and it'd be child's play to expand on them to make things more interesting. Besides the colossal godawful meat cleaver of a sword he's carrying, Tuma also has a Thornax launcher, this year's projectile weapon. It's radically simpler and more elegant than previous efforts - rather than using springs or air pressure, the launcher is simple two spines that hold the Thornax (a kind of seed plant on Bara Magna - depending on how ripe the seed is, used in a launcher it can be anything from a non-lethal nuisance to a deadly fragmentation bomb) in a claw at the end. Push the spines together in the middle and pressure builds up on the Thornax (which has a rubber ring around its middle for this purpose), while at the same time the inward bend of the spine causes the ends of the claws to slightly open. All these motions and forces eventually meet at a point marked "Fire!" and the little thing goes flying. It doesn't quite have the sheer kick of a Midak skyblaster, but it is a lot more fun to fire the weapon "manually," and it's a mark of how well Lego manufactures its products that the spines aren't connected - they just plug into either side of the hand piece, yet even so they maintain the necessary precision to fire properly. That's the kind of thing you can do, I guess, when your production margin of error is two microns. I have to say I like Tuma - he's big and powerful-looking, and well engineered. The only disappointment with him is the dorsal blades, which get knocked out of position easily, and don't really do anything, not like the Mistika's wings and suchlike. 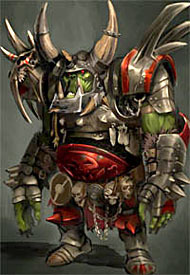 If they'd been replaced by some kind of heavy, armoured carapace, this would've been a really rocking warlord. Of course, it's Lego, so you can always customize him.